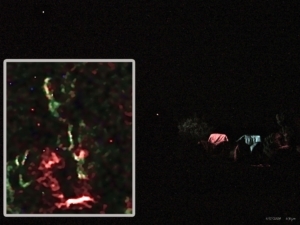 Late the night of November 17, 2009 a series of remarkable–and historic–events transpired, including the visit of an extraterrestrial being within a few feet of the contact team, photographed by a senior team member. 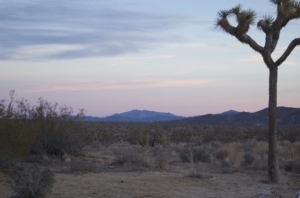 Some background: Since 1996 we have had an increasing level of contact in Joshua Tree. (See the new book “Contact: Countdown to Transformation” for a full history of CSETI contact experiences, including many at Joshua Tree.) In 1996, while conducting a similar expedition in Joshua Tree, we were visited by a very large disc-shaped ET craft that descended quickly from space and merged into the earth. This craft was 200+ feet in diameter, flat on the bottom and rose to a tapered point, much like a Hershey’s Kiss. It was teal green in color, sparkling and not fully materialized, but very brilliant and visible. As it approached the earth, the desert was illumined very briefly as if it were daytime, and the craft rapidly entered the earth. On the night of November 17, 2009, a series of remarkable events transpired. Upon setting up at the site, The Orion Transmissions recurred, with full lock-on of electromagnetic devices, including magnetometers, tri-field meters and radar and laser detectors. During a break, a group of us walked east from our contact site out onto the high desert plain where the craft in 1996 had entered the earth. We observed a strange, scintillating light in the shape of a circular craft, associated with soft, nuanced areas of vertical moving lights which we knew to be ET beings. Suddenly, a brilliant white laser-like light emerged from the ground and shot into space at a 45-degree angle. At this point we knew a ‘vector’ had been set up for further contact. After some time, we turned to go back to the contact circle and suddenly there was an emerald green burst of light in the north, which illumined the entire park area. It appeared to emerge from the ground and go upwards, like a fountain of light, evolving through a number of beautiful colors: gold, pink, and magenta. Around this time, a meteor was reported over Utah, and it is not known if this light was associated–or coincidental–with that meteor. Indeed, interstellar civilizations require full competency of faster-than-the-speed-of-light travel, and with all that this implies. They do not ‘speed up’ to the speed of light and go through it, but instead, by using very advanced physics and electronics, create resonant frequency fields that allow for an object or person to easily phase shift beyond the speed of light into a form that is transdimensional. The closest analogy for humans would be the lucid flying dream, wherein the subtle, astral body leaves the physical body and flies in the ‘dream’ state. But in the case of ET technologies, this is accomplished electronically and technologically. Think of it as a type of electronic astral projection–highly reliable, well controlled and specific. 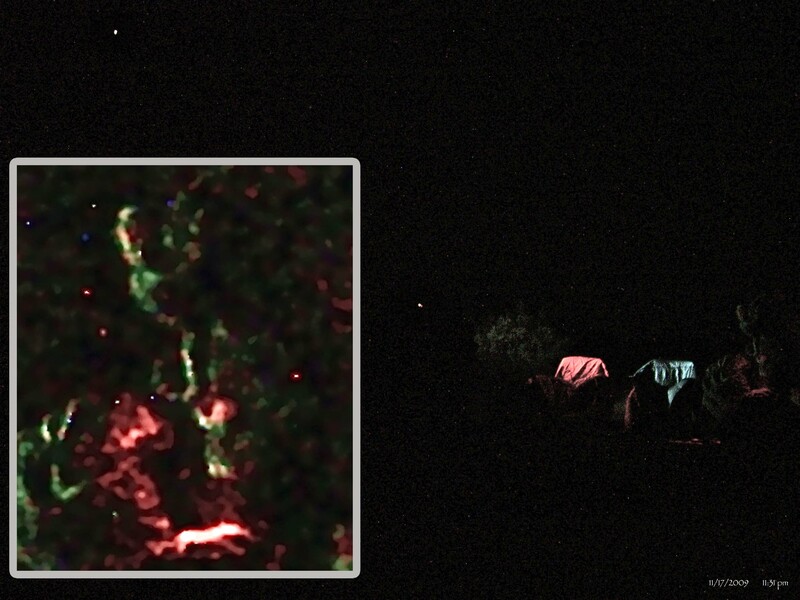 It was at such a moment–after the Orion Transmissions began, after the white laser emerged from the earth, after the 3-inch orb floated up the path with us, after the ET voices were heard–that Raven took this picture. From observing this photograph, one can discern that, given the 3.5-second exposure with a handheld camera, the chairs and bushes are extremely crisp and clear while illuminated by the orb. This indicates a very brief ‘bleed through’ transdimensionally of this orb and ET being–the duration of which was most likely a fraction of a second, making observation with the naked eye unlikely. Neither the human eye’s optics nor the neurological system in the optic nerve and brain would detect such an event, except perhaps as a very brief flash of light. 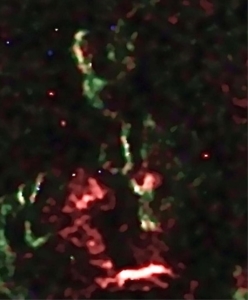 Similarly, the advanced physics and electromagnetic sciences associated with ET travel, communications and interactions may be completely beyond the crossing point of light and not visible at all, or a craft or ET being may be fully materialized, or, in this case, quasi-materialized–between stations, if you will. Moreover, some scientific humility is required: Any civilization capable of reaching Earth from distant galaxies or star systems has, by definition, mastered transluminal and transdimensional sciences. And why would they limit themselves to early 21st century human sciences? Perhaps part of the challenge of the UFO and ET subject is to expand human awareness of what is possible–of contact in multiple dimensions, where thought and machine are one, and where the limit of what is possible exceeds even the sky and space, and reaches to the farthest limits of human consciousness.